Data Types in R take on an interesting twist in contrast to other traditional programming languages like Java and C. In R, the variables are not “declared” with any data type, the variables are assigned some values and the values itself will determine the data type of the variable. R is a very powerful language for data analysis, and I feel that a core understanding of the underlying data types are very important to design your R application wisely and effectively. So what are the data types in R? I wanted to compile a simple definition of the different data types, so I decided to create a quick summary here. Character Character strings "New Story", "a", "yes"
Raw Binary data 48 65 6c 6c 6f = "Hello"
Two-dimensional array, rectangular data set of the same data type. Tabular data objects. Unlike a matrix. 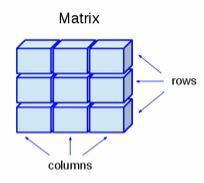 Each column in a data frame can contain different data type. The first column can be numeric while the second column can be character, and the thrid column can be logical. This can basically represent a database table, or an excel spread sheet. 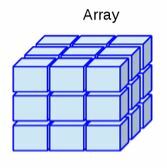 Arrays can be of any number of dimensions. Each dimension is a vector of the same type. Can contain many different types of elements inside it, like vectors, functions, and another list. Factors are R objects created using a vector. It automatically stores additional data like distinct valued of the elements in a vector as labels. Very useful in statistical modeling. Next Article Next Article: Time to cut the cord?